a Innovam? ?dica SAPI de CV, M? ?xico City, M??xico. b Instituto Nacional de Cardiolog? ?a Ignacio Ch? ?vez, M? ?xico City, M??xico. Department of Health Care, Universidad Aut? ?noma Metropolitana-Xochimilco. M? ?xico City, M??xico. 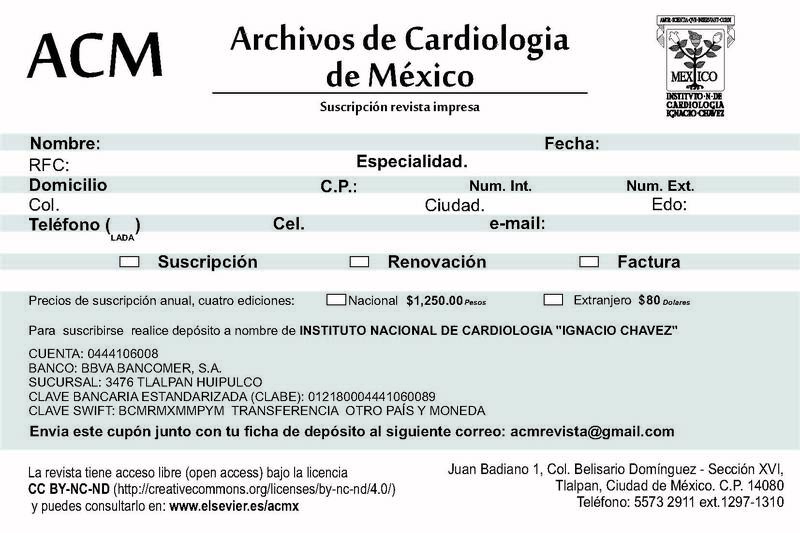 c Instituto Nacional de Cardiolog? ?a Ignacio Ch? ?vez, M? ?xico City, M??xico. d Innovam? ?dica SAPI de CV, M? ?xico City, M??xico. Laboratorio de Instrumentaci? ?n, Universidad Aut? ?noma Metropolitana-Iztapalapa. M? ?xico City, M??xico. Objetivo: Evaluar la hemocompatibilidad de un nuevo dispositivo de asistencia ventricular (DAV, Innovamédica, México) neumático e implantable, en cerdos sanos. En este estudio piloto se propuso determinar primero, si la implantación a corto plazo del DAV suscitaría una respuesta inflamatoria por encima de aquella esperada tras trauma quirúrgico; segundo, evaluar si recubrimientos heparinizados o pasivos del DAV, en combinación con tratamientos sistémicos anticoagulantes o antiplaquetarios, modificarían la hemocompatibilidad del DAV. Métodos: Se midieron parámetros hemodinámicos, fisiológicos, inflamatorios e histológicos en 27 cerdos recibiendo soporte del DAV durante seis horas, evaluando combinaciones de recubrimientos heparinizados y pasivos del DAV, y terapias sistémicas anticoagulantes / antiplaquetarias. Se obtuvieron, a partir de sangre, las concentraciones promedio de interleucina-1 (IL-1β), interleucina-6 (IL-6), proteína C reactiva (PCR) y los complejos trombina-antitrombina III (TAT) (índice de coagulación). Se emplearon análisis estadísticos ANOVA. Resultados: No se observaron incrementos importantes en los niveles promedio de IL-1β, IL-6, PCR, o TAT durante soporte del DAV. Los parámetros hemodinámicos y fisiológicos fueron normales. No existió evidencia alguna de tromboembolias o micro-infartos en muestras de miocardio y pulmón. No se encontraron coágulos o depósitos mayores en compartimentos del DAV. En general, no se apreciaron diferencias notables de mediciones utilizando dispositivos con recubrimiento heparinizado, pasivo o sin recubrimiento, en conjunto con terapia sistémica anticoagulante, antiplaquetaria o sin ella. Conclusiones: Nuestros hallazgos demuestran, primero, que durante el periodo de medición experimental, el DAV suscitó una respuesta inflamatoria mínima por encima de los efectos de trauma quirúrgico, y; segundo, en todos los casos evaluados, se observaron escasos o inexistentes efectos de coagulación durante soporte ventricular. Contemplando estudios adicionales de validación, nuestros datos indican que el DAV Innovamédica es un sistema altamente hemocompatible. Objective: To assess the hemocompatible performance of a novel implantable pneumatic ventricular assist device (VAD, Innovamédica, México) in healthy swine. The aim of this pilot study was first, to determine if short-term VAD implantation elicited a remarkable inflammatory response above that expected from surgical trauma; and second, to assess if heparinized or passivated VAD coatings, in combination with systemic anticoagulant or antiaggregant therapies, modified the VAD? ?s hemocompatible performance. Methods: Hemodynamic, physiologic, inflammatory and histological parameters were measured in 27 pigs receiving VAD support for six hours, testing combinations of heparinized or passivated VAD coatings and systemic anticoagulant/antiaggregant therapies. Mean concentrations of interleukin-1 β (IL-1β), interleukin-6 (IL-6), C-reactive protein (CRP), or thrombin-antithrombin III (TAT) complexes (coagulation indicator) were measured from blood. ANOVA statistics were employed. Results: No substantial increases in mean IL-1β, IL-6, CRP, or TAT were obtained during VAD support. Hemodynamic and physiologic parameters were normal. We found no evidence of thromboembolisms or micro-infarctions in heart and lung samples. No major coaguli/deposits were found in VAD compartments. Overall, no remarkable differences in measurements were found using heparinized, passivated, or uncoated VAD, or with systemic anticoagulation, antiaggregant therapy, or no treatment. Conclusions: Our findings demonstrate, firstly, that during the time-period tested, the VAD elicited negligible inflammation above the effects of surgical trauma; and secondly, that little coagulation was observed upon VAD support in any of the cases tested. Contemplating further validation studies, our data indicate that the Innovamédica VAD is a highly hemocompatible system. Figure 1. Diagram of VAD connection to experimental subjects. Cannulae were connected to right and left internal jugular veins of anesthetized pigs. The VAD was connected to the cannulae on one end, and on the other end, to the drive unit console. An enhanced view of the VAD compartments is depicted in the circle, showing top and bottom shells, disposable sac, connectors, valves, and cannulae entry points. To attain a better defined product development strategy for the new VAD device, we designed a pilot study using swine as animal subjects, evaluating VAD hemo-compatibility. In the work presented herein we show the results of this hemocompatibility assessment, whereby hemodynamic, physiologic, and inflammatory variables were measured. We hypothesized that VAD support in vivo should not elicit a significant inflammatory response exceeding the one observed by surgical trauma. Our objective in this study was two-fold: first, to evaluate the inflammatory response of pigs receiving VAD support for a period of six hours, and second, to compare - during this same experimental time-frame - the hemocompatibility performance of three types of coatings used on the silicone rubber surfaces of the VAD device (uncoated, heparinized and passivated coatings), in combination with three types of systemic anticoagulation therapy (no treatment, heparin treatment or antiaggregant treatment). In order to reduce the thrombogenic potential of circulatory support devices, it is often necessary to administer high doses of systemic anticoagulation therapy, such as heparin.5 However, to this date, there is controversy as to the dosage of systemic heparinization required in cardiopulmonary bypass (CPB) procedures.5 Acetylsalicylate, in proper doses, has also been shown to partially block the effects of platelet recruitment and aggregation.11 To evaluate the requirement of systemic heparinization in our system, we compared three systemic therapies in experimental subjects: no treatment, heparinization, or platelet antiaggregant treatment (clopidogrel sulfate and aspirin). We questioned whether one, if any, of these treatments and/or coatings, would provide a more favorable outcome for hemocompatible VAD performance. The aim of our experimental design was to demonstrate that the Innovamédica VAD was hemocompatible, i) by not eliciting a remarkable inflammatory response during cardiovascular support and, ii) by not exhibiting inherent thrombogenic potential. As readout, inflammatory parameters were measured from animals during VAD support: namely, IL-1β, IL-6, C-reactive protein, and thrombin-antithrombin III complexes, the latter a coagulation indicator. An assessment of coaguli deposits in porcine tissues, as well as in VAD components was also undertaken. Collectively, our results demonstrate that the Innovamédica VAD can be safely employed in cardiovascular procedures in swine for a period of at least six hours, without eliciting a major inflammatory response. We also conducted a pathological evaluation of lung and heart pig tissue samples post-mortem, in order to assess the incidence of thromboembolisms. Lastly, a visual assessment of thrombi formation and/or deposits in the VAD disposable compartments was undertaken. Experimental surgeries: Twenty-seven York/Landrace pigs (23 male, four female) were obtained from an animal farm, (body weight 22-40 kg, 3-4 months old). The presence of parasites and/or other diseases was examined, as well as blood chemistry tests performed for all pigs prior to surgical procedures. Only healthy animals were included in the study. The swine had free access to lab chow and water but were fasted overnight (12 h prior to surgery). On the day of surgery, animals were sedated with azaperone (intramuscular (IM), 2 mg/kg) and administered benzyl penicillin antibiotic (IM, 800,000 U), 3 mg atropine sulfate (parenteral cholinergic) and 2-3 mL tiletamine/zolacepam anesthetic, IM). Animals were subsequently bathed and prepared for surgery. The animal protocols described herein were previously approved by institutional committees and followed the Federal Regulations for Animal Experimentation and Care (Ministry of Agriculture, SAGARPA, México). For surgical procedures, general anesthesia was maintained via isoflurane (1.5% - 2%) and 100 mg/hour (IM) of tiletamine/zolacepam. Subjects were monitored as follows: third-level derivation electrocardiogram (ECG), mean arterial blood pressure (MABP), central venous pressure (CVP), capnography (EtCO2), pulse oximetry (SpO2) and rectal temperature. Ventilation parameters were monitored through arterial gasometry. The 27 pigs were randomized into treatment case groups in combination with VAD coating case groups. Treatment case groups consisted of a Control VAD support group without systemic heparinization (n = 9); Heparin group (n = 9), VAD implant with heparinization, Activated Clotting Time (ACT) at 200s; Antiaggregant group (n = 9), VAD implant with antiaggregant treatment (clopidogrel bisulfate plus aspirin). VAD coating case groups consisted of Uncoated VAD; Hep-Coat VAD (anti-coagulant, heparin-based coating) and Pass-Coat VAD (passivated, fatty-acid based, hydrophilic coating) (SurModics Inc., Eden Prairie, MN, USA). Animals from the Heparin group received periodic anti-coagulant treatment (heparin, IV) throughout surgeries, with sufficient dosage to maintain ACT near 200s. Animals from the Antiaggregant group received antiaggregant oral treatment prior to surgery (675 mg clopidogrel bisulfate plus 500 mg acetylsalicylate). All animals in the study received a dose of 1000 - 2000 U endovenous heparin prior to commencing ventricular support. The swine were thoracotomized (median sternotomy), and cannulae inserted into left and right internal jugular veins. The VAD was connected to the cannulae thereafter, and right VAD support was initiated, allowing jugular-tojugular bypass circulation. Pumping ensued for 300 min. The VAD's drive unit parameters were maintained at f = 50 bpm, Q = 1.8 l/minutes. A schematic diagram of the VAD implant and connection to experimental subjects is shown in Figure 1. Body temperature, cardiac frequency and hemodynamic and physiologic parameters (from arterial and venous blood), were monitored throughout experiments. To measure hemodynamic variables, ACT was measured using a Hemochron 401 blood coagulation timer (ITC Med, Edison, NJ, USA), and hematocrit measured, either by approximation method or by using a blood gas analyzer (Gem Premier 3000, Instrumentation Laboratory, Brussels, Belgium). Arterial blood samples were obtained from subjects during specific time-points: pre-quirurgical baseline Tb; post-quirurgical baseline T0, prior to, or close to cannulation, with subsequent VAD support (pump "ON"); 100 min VAD support; 200 min VAD support; 300 min VAD support. Samples were processed for analysis of inflammatory variables IL-1β, IL-6, CRP and TAT. After 300 min of VAD support, animals were euthanized with potassium chloride solution (60 mEq, IV) under general anesthesia. Cardio-pulmonary autopsies were performed and lung and heart organs preserved in formaldehyde for histological analysis. Additionally, the VAD's cannulae and disposable sacs were visually inspected for the presence of coaguli. Enzyme-linked immunoabsorbent assays (ELISAs): For IL-1β, IL-6 and CRP protein measurements, porcine serum was obtained from arterial blood at specific time-points (see above) according to standard methods (15 min centrifugation at 4ºC, 3000 rpm). For TAT complex measurements, porcine plasma was separated from arterial blood samples at specific time-points, in 8:2 parts of total blood: anticoagulant, according to standard methods (3.2% sodium citrate and 15 min centrifugation at 4ºC, 3500 rpm). Serum or plasma-containing supernatants were frozen in dry ice and stored at -70ºC to -80ºC for future analysis. ELISAs were performed according to standard methods using the Quantikine porcine IL-1β/IL-1F2 and IL-6 kits (R&D Systems, Minneapolis, MN, USA), and the porcine C-reactive protein ELISA (ALPCO Diagnostics, Salem, NH, USA). A human thrombin-antithrombin III complex kit, Enzygnost TAT micro (Dade Behring, Eschborn, Germany), cross-reactive with porcine plasma, was also employed. Absorbances were read in triplicate at 450 nm (IL-1β, IL-6, CRP), and in duplicate at 490 nm (TAT) via spectrophotometry (Dynex technologies Inc, Chantilly, VA, USA), and protein concentrations calculated from standard calibration curves. Positive controls were included for ELISA kits IL-1β, IL-6 and TAT, verifying that concentration measurements for experimental subjects were bona fide. Statistical analysis: This was an experimental, randomized comparative study. One way ANOVA or a Univariate Analysis of Variance was performed to compare means of ACT, hematocrit, body temperature, cardiac frequency, body weight and body size. Data were expressed as mean ± standard deviation of the mean (mean ± SD). ANOVA of repeated measures and a Univariate Analysis of Variance were used to calculate statistical significance of the mean concentration of IL-1β, IL-6, CRP, TAT. P < 0.05 were considered statistically significant. Data analysis was conducted using SPSS statistical software (SPSS Inc, Chicago, IL, USA). Study group: The mean age of animals was 3.5 ± 0.5 months, and the mean body weight was 32.1 ± 5.4 kg, with a range of 22-40 kg. Mean body size was 101.7 ± 9.6 cm, with a range of 84-130 cm. Animal weight or body size did not vary significantly according to treatment group or coating cases, or according to the combination of group and coating cases. Hematocrit - This values were measured from baseline onwards throughout surgical procedures, averaging a total hematocrit mean of 27.04% ± 7.495 (n = 97), with a range of 15% - 45%. No statistical differences in hematocrit values were observed between treatment groups, coating cases or group and coating case combinations. Importantly, variations in hematocrit values did not exceed 1.375 - fold relative to baseline values. ACT - The mean ACT of pigs (periodic measurements) was as follows; for treatment case groups: 155.6 ± 106.9 s (Control, n = 36), 208.7 ± 63.2 s (Heparin group, n = 39) and 130.9 ± 31.3 s (Antiaggregant group, n = 38); for coating case groups: 187.5 ± 112.5 s (Uncoated, n = 40), 155.9 ± 48.0 s (Hep-Coat, n = 37) and 151.4 ± 54.2 s (Pass-Coat, n = 36). Total ACT mean (n = 113) was 165.6 ± 79.6 s with a range of 60-714 s. Statistical differences were found between treatment groups (p = 0.000) and coating cases (p = 0.043), but not between treatment group and coating case combinations. Pairwise comparisons demonstrated lower mean ACT in the Antiaggregant group relative to the Heparin treatment group (p = 0.000), and lower ACT in the Control (untreated) group relative to the Heparin treatment group (p = 0.001). Inflammation parameters: To assess the induction of inflammatory responses upon VAD implantation, we chose to measure serum IL-1β, IL-6 and CRP concentrations during experimental procedures at specified time-points. Figures 2, 3 and 4 show the results of IL-1β, IL-6 and CRP measurements, respectively. Results indicated that the mean IL-1β concentration (range between 33.3 -89.9 pg/mL) did not change or increase substantially in treatment groups or coating cases with VAD support relative to controls (Figure 2). The lowest mean IL-1β concentrations were observed in the Hep-Coat case relative to other cases, and in the Heparin group, relative to other treatment groups. Mean IL-1β changes were statistically significant between coating cases (p = 0.012), but not between treatment groups or in the combination of groups and coating cases. Pairwise comparison for coating cases showed that changes were significant between Hep-Coat and Pass-Coat only (p = 0.030), with lower mean IL-1β concentrations in the Hep-Coat cases relative to the Pass-Coat cases. For treatment groups, changes were significant between Heparin and Antiaggregant groups only (p = 0.003), with lower mean IL-1β concentrations in the Heparin group relative to the Antiaggregant group. An ANOVA analysis of repeated measures (n = 24 for each time-point, five time-points), was used to examine the effect of time on overall mean IL-1β concentrations, showing that despite an increased trend in mean IL-1β concentration with time, this change was not statistically significant. Figure 2. Mean serum concentrations of porcine IL-1β during VAD support. Mean IL-1β concentrations (pg/mL) by treatment groups. Tb: pre-baseline; T0: baseline, pump "ON"; 100 min VAD support; 200 min VAD support; 300 min VAD support. Uncoated, Hep-Coat and Pass-Coat VAD coating cases are shown for Control (untreated), Heparin and Antiaggregant treatment groups. Error bars represent standard error from mean values. Our findings also indicated that the mean IL-6 levels (range between 70.1 - 150.3 pg/ml) did not change or increase substantially in treatment groups or coating cases with VAD support relative to controls (Figure 3), with the exception of the Hep-Coat coating case within the Heparin group, which unexpectedly exhibited higher mean IL-6 concentrations than other coatings. Mean IL-6 concentrations for Pass-Coat cases were lower than those of other coating cases for the Control and Heparin groups (Figure 3). Differences in mean IL-6 levels were statistically significant between treatment groups (p = 0.008), coating cases (p = 0.000), and for treatment group and coating case combinations (p = 0.000). Pairwise comparisons showed statistical significance in mean IL-6 differences between Uncoated and Hep-Coat cases (p = 0.000), with lower mean IL-6 concentrations in the Uncoated relative to Hep-Coat cases. Changes in mean IL-6 levels were also statistically significant between Hep-Coat and Pass-Coat cases (p = 0.000), with lower mean IL-6 concentrations in the Pass-Coat relative to Hep-Coat cases. Pairwise comparisons showed statistical significance of IL-6 changes between the Control and Heparin groups only (p = 0.002), with lower mean IL-6 levels in the Control group relative to the Heparin group. An ANOVA analysis of repeated measures (n = 22 for each time-point, five time-points) was used to examine the effect of time on overall mean IL-6 concentrations, exhibiting a trend towards increase with time, but which was not statistically significant. Figure 3. Mean serum concentrations of porcine IL-6 during VAD support. Mean IL-6 concentrations (pg/mL) by treatment groups. Tb: pre-baseline; T0: baseline, pump "ON"; 100 min VAD support; 200 min VAD support; 300 min VAD support. Uncoated, Hep-Coat and Pass-Coat VAD coating cases are shown for Control (untreated), Heparin and Antiaggregant treatment groups. Error bars represent standard error from mean values. In addition, results showed that the mean CRP concentrations (range between 8.7 - 40.3 ng/mL) were lower in Pass-Coat cases relative to Uncoated or Hep-Coat cases, particularly for the untreated (Control) and Heparin groups (Figure 4). Mean CRP changes were statistically significant between coating cases (p = 0.000), and for the combination of group and coating cases (p = 0.000), but not between treatment groups. Pairwise comparisons showed that differences in coating cases were significant between Uncoated and Pass-Coat cases (p = 0.000), with lower mean CRP levels in Pass-Coat cases relative to Un-coated cases. CRP changes were also significant between Hep-Coat and Pass-Coat cases (p = 0.000), with lower mean CRP levels in Pass-Coat cases relative to Hep-Coat cases. An ANOVA analysis of repeated measures was used to examine the effect of time on overall mean CRP levels (n = 25 for each time-point, five time-points), showing that changes in mean CRP levels with time were statistically significant (p = 0.033). CRP concentrations decreased after quirurgical intervention, and maintained reduced levels in later time-points of VAD support. Figure 4. Mean serum concentrations of porcine CRP during VAD support. Mean CRP concentrations (ng/mL) by treatment groups. Tb: pre-baseline; T0: baseline, pump "ON"; 100 min VAD support; 200 min VAD support; 300 min VAD support. Uncoated, Hep-Coat and Pass-Coat VAD coating cases are shown for Control (untreated), Heparin and Antiaggregant treatment groups. Error bars represent standard error from mean values. Coagulation parameters: The presence of TAT complexes in plasma is representative of the activation of coagulation and thrombin generation, and is utilized as an indicator of the induction of clotting events. To monitor the initiation of thrombogenesis with VAD support, we measured the presence of TAT complexes in porcine plasma samples at specified time-points of VAD support (Figure 5). Mean TAT complex concentrations (range between 5.5 - 45.6 µg/L) exhibited a significant time-dependent increase with VAD support, (p = 0.005 by ANOVA of repeated measures; n = 24 for each time-point, four time-points). Reduced levels of TAT complex concentrations were observed when Hep-Coat was used in Heparin group subjects relative to other VAD coatings, but this trend was not observed in other groups. Heparin group subjects also exhibited overall, lower TAT concentrations than in other groups. However, the changes in mean TAT concentration were not statistically significant, either by group, by coating cases, by the combination of group and coating cases, or by pairwise comparisons. Figure 5. Mean plasma concentrations of porcine TAT during VAD support. Mean TAT concentrations (µg/L) by treatment groups. T0: baseline, pump "ON"; 100 min VAD support; 200 min VAD support; 300 min VAD support. Uncoated, Hep-Coat and Pass-Coat VAD coating cases are shown for Control (untreated), Heparin and Antiaggregant treatment groups. Error bars represent standard error from mean values. Pathological examination of heart and lung: In order to assess the incidence of thromboembolisms in our experimental subjects, we conducted a pathological evaluation of lung and heart pig organs and tissue samples post-mortem. Macroscopically and histologically, lung and heart organs were completely healthy in appearance. Scarce and isolated coaguli were occasionally found in myocardial and pulmonary tissues, but upon histological examination, it was evident that these were formed post-mortem, and were not the result of VAD implantation on experimental subjects. The majority of micro-thrombi were indeed hematic (and not fibrinous) in all tissues examined (post-mortem thrombi). We found no correlation between tissue status and subject treatment cases or VAD coatings used in this study. 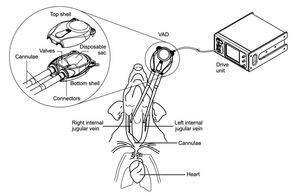 As an index of hemocompatibility of the VAD's material surfaces, the status of the device's disposable parts (disposable sac, cannulae connectors and valves) was examined after each surgery post-mortem. The purpose was to ensure that no significant clots were adhering to key material surfaces of the VAD that had been directly exposed to blood. During surgeries, little or no formation of clots in VAD compartments was observed; all material surfaces remained clean during VAD function. Minimal formation of clots or deposits in VAD compartments was seen post-mortem, a normal occurrence upon subject euthanasia and circulatory shut-down to the time VAD components were examined. Importantly, these clots were easily dislodged, and did not adhere to material surfaces. In the present pilot study, we assessed hemodynamic, physiologic, inflammatory, and histological variables in order to evaluate the hemocompatibility of the Innovamédica VAD during a six hour time-period of VAD support, in swine. Despite certain fluctuations in ACT, all other physiologic parameters (temperature, cardiac frequency), or hemodynamic variables (e.g. hematocrit) were normal in this study, and were not significantly different between treatment groups and coating cases, as expected. Summarizing the results, we determined that mean IL-1β, IL-6 and CRP concentrations did not change or increase substantially in treatment groups or coating cases with VAD support relative to controls (Figures 2, 3, and 4, respectively). The lowest mean IL-1β concentrations were observed in the Hep-Coat case subjects relative to other cases. In contrast to IL-1β, mean IL-6 concentrations were higher in Hep-Coat cases, and lower in Pass-Coat cases. The significance of these specific results warrants further investigation. Mean CRP concentrations were lower in Pass-Coat cases relative to Uncoated or Hep-Coat cases, particularly for the untreated group (Control). Mean TAT complex concentrations exhibited a significant time-dependent increase with VAD support, as would be expected from surgical trauma (Figure 5). Reduced levels of TAT complex concentrations were observed in Hep-Coat subjects in the Heparin group relative to other VAD coatings. Heparin group subjects also exhibited, overall, lower TAT concentrations than in other groups. This suggests that VAD heparin coating, and heparin systemic treatment might have potentially contributed to a reduction in overall TAT levels. It should be noted that for IL-1β and IL-6 assays, reported values do not reflect exact physiologic concentrations, given that calibration curves were adjusted using a correction factor to observe trends in protein concentrations according to treatment groups and coating cases. The concentrations measured for these two proteins were in fact, barely detectable above background, and above the detection limits of the assay (10 pg/mL). It should also be specified that we did not perform hemodilution corrections in our data (relative to hematocrit), given that we lacked some hematocrit values in certain surgeries, and because we additionally verified that hemodilution-corrected values were not dramatically different from uncorrected values. IL-1β and IL-6 play pivotal roles in the immune response and in inflammation.18 IL-1β induction generally occurs within 1-2 hours, increasing thereafter,19 IL-6 and CRP play important roles in acute phase reactions18 and their induction generally begins at 2-4 h,18 and 5-6 hours to 12 hours,16,20 respectively, increasing thereafter. Relevant to this study, previous work has majorly focused on the elevation of cytokines and other inflammatory variables during post-operative periods of cardiovascular procedures. Many of these studies report conflicting observations regarding protein concentration and kinetics of cytokine secretion. For instance, IL-1β levels have been shown to increase during the first 24 hours post-CPB in various human studies,21-23 albeit undetectable in others.24-27 Plasma and serum IL-6 levels have been shown to increase after CPB, reaching a peak at 3 to 24 hours post CPB.23,25,26,28-30 Interestingly, a report by Inui et al, has shown increased IL-6 and TAT plasma levels in patients receiving CPB at 30' and 60' relative to baseline, but lower levels when a heparin-coated CPB circuit was applied, suggesting that heparin might have contributed in lowering the levels of these factors.29 However, another study in patients receiving CPB, reported that plasma IL-6 levels did not vary significantly from pre-operative to post-operative time-points, or throughout surgeries.15 Certain studies in pigs have shown that lung IL-1β was not substantially increased during CPB (144 ± 88 pg/mL, 189 ± 68 pg/mL, 152 ± 71 pg/mL at baseline, 10', and 120'CPB, respectively), whereas IL-6 was increased (112 ± 36 pg/ml, 187 ± 33 pg/mL, 1004 ± 97 at baseline, 10', and 120'CPB, respectively).31,32 With regard to plasma cytokine levels in pigs undergoing CPB, there is a report of IL-6 remaining below detection levels (< 10 pg/ml) at baseline, but increasing to 240 ± 103 pg/ml and 981 ± 37 pg/ml at 15' and 8h respectively, post-CPB.33 Another pig study reported plasma IL-6 levels as low as 2 ng/mL at five minutes pre-CPB, and at 25 minutes, after receiving two hours of CPB.34 These reports are consistent with our findings of very low concentrations of porcine IL-1β and IL-6, during the six-hour time-period of VAD support. IL-6 and C-reactive protein (CRP) serum levels have been reported to increase mostly in the immediate days following cardiovascular surgery,23,35 and in humans, CRP levels have been shown to increase particularly 24h after CPB.36,37 Cut-off CRP levels for CPB patients have been suggested to be approximately 460 ng/ml pre-operatively, and 1790 ng/ml on the first post-operative day.38 With regard to porcine levels, studies in neonatal pigs have demonstrated relatively similar CRP levels in animals undergoing CPB when compared to sham-operated animals.39 In our study, we observed CRP concentrations ranging from 8.7 to 40.3 ng/mL, thus, well below what has been reported. With regard to plasma TAT concentrations, studies in human patients have shown increases in TAT levels from 4.2 µg/L at baseline, to 49.1 µg/L upon CPB,7 and from 10 µg/l at baseline to 50 µg/l upon CPB.40 In pigs receiving 2h of CPB, there are reports of post-operative TAT plasma levels at 20.7 ± 1 µg/l, IL-1β levels at 1081.8 ± 203 pg/ml, and IL-6 levels at 173 ± 91.5 pg/ml.17 Consistent with these reports, we have observed porcine TAT concentrations ranging from 5.5 to 45.6 µg/L. In agreement with findings showing much later peaks of cytokine and CRP production in days following cardiovascular surgery, the low porcine IL-1β, IL-6 and CRP concentrations detected in this study reflect that - in our hands - these factors are not increased significantly in the first six hours of VAD support, and furthermore, their levels remain well below the concentrations detected in various CPB studies. Taken together, our data show that there were no remarkable differences or increases in IL-1β, IL-6, CRP or TAT levels with VAD support, or relative to treatment groups or coating cases. The trends in increased IL-1β and IL-6 concentrations with time (not significant) were not remarkable, and would be expected with surgical trauma, but because we did not find significant differences between control and groups/cases, in support of our hypothesis, implantation of our VAD device does not induce a strong inflammatory response above that observed from surgical trauma. Moreover, CRP levels did not increase with VAD support in a time-dependent manner, and this concurs with the observation that an inflammatory response was not strongly induced, even when considering that CRP levels are not usually highly increased before six hours. Because the effects of using Hep-Coat vs Pass-Coat for VAD support were not consistent for the different inflammatory variables tested, we cannot arrive at a consensus as to which VAD coating was inherently more hemocompatible, or more favorable in preventing an inflammatory reaction. Similarly, we cannot presently determine which treatment group was more favorable for experimental subjects during VAD support, despite a tendency towards lower concentrations of inflammatory variables in Heparin group subjects (systemic heparin treatment). Based on other reports, we expected that heparin treatment would result in a lessened inflammatory response (lower levels of cytokines and/or other factors). Surprisingly, our results showed that other treatments resulted in outcomes that were, seemingly, just as favorable as that of heparin treatment. Worth mentioning is the fact that a minimum of anti-coagulant activity (heparin) was required in order to properly connect the VAD device to animals, including the Control group (with no additional anti-coagulant treatment). Hence, this minimum heparin dosage might have been sufficient to suppress a remarkable inflammatory response, or thrombogenic activity. Longer ACT times observed in some instances could thus be easily explained by given anti-coagulant dosage during VAD support. Whether heparin systemic treatment, or heparin-coating of the VAD device results in a more hemocompatible outcome during surgery warrants further investigation, as it could be that these conditions are not necessarily advantageous. The use of heparin-coated vs uncoated devices in long-term VAD support trials may help elucidate these questions. Histological analysis of organs confirmed that VAD support did not elicit a substantial inflammatory response in our subjects during the time-frame tested; the absence of thromboembolisms or pulmonary/myocardial infarctions led us to determine that no complications ensued from VAD implantation in experimental subjects. The minor and scarce thrombi found histologically, were not of a fibrinous nature, and were with all likelihood, the result of post-mortem circulatory shut-down. From histological and macroscopic examination of porcine heart and lung organs, VAD coating cases and treatment groups were indistinguishable from each other and from controls. Moreover, no major coaguli or deposits were found in any of the compartments of the VAD device throughout experiments. The minor coaguli found were once again, the result of post-mortem circulatory shut-down. Study limitations: The current study has limitations, and a better delineation of the hemocompatibility properties of the VAD coatings tested, and of the potential systemic treatments considered during VAD support, is warranted. Future studies should aim to expand the current findings, particularly in the context of long-term VAD support. For instance, the inclusion of additional cytokine/coagulation factor measurements could be contemplated for long-term VAD support experiments. Various changes (increases) in adhesion molecule expression from human platelets and endothelial cells have been observed during CPB (such as L-selectin, P-selectin, and certain integrins).27 Thus, changes in platelet activation/aggregation and adhesion molecule surface expression could also be addressed during long-term VAD support trials. We have determined that the Innovamédica VAD does not elicit a remarkable inflammatory response during a six-hour time-frame of cardiovascular support, and does not exhibit inherent thrombogenic potential. The impact on VAD hemocompatibility, of heparinized or passivated coatings, in combination with systemic anticoagulant or antiaggregant therapies, requires further elucidation at this time. Our findings of low levels of inflammatory variables, in conjunction with low levels of coagulation, strongly indicate that this novel VAD system is highly hemocompatible. We are grateful to Javier Molina, Rodolfo Barragán, Felipe Massó, Vanessa Galván, Francisco Tovar, Humberto Martínez, Jorge Krafft, Ursina Díaz and Andrés Moron for technical assistance and helpful discussions. We thank Benito Chávez for the preparation of histological slides. We are especially grateful to Alejandro Bolaños for his help in making the VAD diagram, and to Nohra Beltrán for very useful discussions on statistical analysis. We also thank members of the Laboratorio de Instrumentación, UAM Iztapalapa, members of Innovamédica SAPI de CV, and members of the Instituto Nacional de Cardiología Ignacio Chávez for their support and participation in this project. accepted in November 12, 2009. Sacristán E, Corona F, Suárez B, et al..
Development of a univer-Development of a universal second generation pneumatic ventricular assist device and drive unit..
Sacristán E: Air-pressure powered driver for pneumatic ventricular assist devices..
US7074176b2. Patent version number 7,074,176 US: Innovamedica S.A. de C..
Calderón M, Sacristán E: Universal pneumatic ventricular assist device..
US7217236. Patent version number 7,217,236. In: http://patftusptogov/netacgi/nph-Parser?Sect1=PTO2&Sect2 =HITOFF&u=%2Fnetahtml%2FPTO%2Fsearch-US: Innovamedica S.A. de C..
DeFife K, Shive MS, Hagen KM, et al.. Effects of photochemically immobilized polymer coatings on protein adsorption, cell adhesion, and the foreign body reaction to silicone rubber..
Bannan S, Danby A, Cowan D, et al..
Low heparinization with heparin-bonded bypass circuits: is it a safe strategy? Ann Thorac Surg 1997..
Koster A, Loebe M, Sodian R, et al..
Heparin antibodies and thromboembolism in heparin-coated and noncoated ventricular assist devices..
Ovrum E, Holen E, Tangen G, et al.. Completely Heparinized Cardiopulmonary Bypass and Reduced Systemic Heparin: Clinical and Hemostatic Effects..
Wildevuur C, Jansen P, Bezemer P, et al..
Clinical evaluation of Duraflo II heparin treated extracorporeal circulation circuits (2nd version)..
Mottaghy K, Oedekoven B, Bruchmeller K, et al..
Heparin free long-term extracorporeal circulation using bioactive surfaces..
Colman RW, Hirsh J, Marder VJ, et al..
Hemostasis and Thrombosis-Basic Principles and Clinical Practice..
Cain B, Meldrum DR, Dinarello CA, et al..
Tumor necrosis factor-alpha and interleukin-1beta synergistically depress human myocardial function..
Hall R, Smith MS, Rocker G: The systemic inflammatory response to cardiopulmonary bypass: pathophysiologica.l, therapeuti.c, and pharmacological considerations..
Abe K, Nishimura M, Sakakibara T: Interleukin-6 and tumor necrosis factor during cardiopulmonary bypass..
Aljassim O, Karlsson M, Wiklund L, et al.. Inflammatory response and platelet activation after off-pump coronary artery bypass surgery..
Amezcua-Guerra LM, Springall del Villar R, Bojalil Parra R: C-reactive protein: cardiovascular issues of an acute-phase protein..
Banz Y, Rieben R, Zobrist C, et al.. Addition of dextran sulfate to blood cardioplegia attenuates reperfusion injury in a porcine model of cardiopulmonary bypass..
Janeway C, Travers P, Walport M, et al..
Ahlers AA, Schønheyder H: C-reactive protein in patients with infection..
Lahat N, Zlotnick AY, Shtiller R, et al..
Serum levels of IL-1, IL-6 and tumour necrosis factors in patients undergoing coronary artery bypass grafts or cholecystectomy..
Menasché P, Haydar S, Peynet J, et al..
A potential mechanism of vasodilation after warm heart surgery..
Roth-Isigkeit A, Hasselbach L, Ocklitz E, et al..
Inter-individual differences in cytokine release in patients undergoing cardiac surgery with cardiopulmonary bypass..
Steinberg B, Grossi EA, Schwartz DS, et al..
Heparin bonding of bypass circuits reduces cytokine release during cardiopulmonary bypass..
Butler J, Chong GL, Baigrie RJ, et al..
Cytokine responses to cardiopulmonary bypass with membrane and bubble oxygenation..
Sawa Y, Shimazaki Y, Kadoba K, et al..
Attenuation of cardiopulmonary bypass-derived inflammatory reactions reduces myocar-dial reperfusion injury in cardiac operations..
Asimakopoulos G, Taylor K: Effects of cardiopulmonary bypass on leukocyte and endothelial adhesion molecules..
Kawamura T, Wakusawa R, Okada K, et al..
Elevation of cytokines during open heart surgery with cardiopulmonary bypass: participation of interleukin 8 and 6 in reperfusion injury..
Inui K, Shimazaki Y, Watanabe T, et al.. Effects of Duraflo II heparin-coated cardiopulmonary bypass circuits on the coagulation system, endothelial damage, and cytokine release in patients with cardiac operation employing aprotinin and steroids..
Kitano T, Mori M, Hoashi S, et al..
Interleukin-6 and glucocorticoid responses to cardiopulmonary bypass..
Siepe M, Goebel U, Mecklenburg A, et al..
Pulsatile pulmonary perfusion during cardiopulmonary bypass reduces the pulmonary inflammatory response..
Goebel U, Siepe M, Mecklenburg A, et al.. Carbon monoxide inhalation reduces pulmonary inflammatory response during cardio-pulmonary bypass in pigs..
Liakopoulos OJ, Teucher N, Mühlfeld C, et al..
Prevention of TNFalpha-associated myocardial dysfunction resulting from cardiopulmonary bypass and cardioplegic arrest by glucocorticoid treatment..
Dodd-o JM, Welsh LE, Salazar JD, et al..
Effect of NADPH oxidase inhibition on cardiopulmonary bypass-induced lung injury..
Franke A, Lante W, Fackeldey V, et al..
Pro-inflammatory cytokines after different kinds of cardio-thoracic surgical procedures: is what we see what we know? Eur J Cardiothorac Surg 2005..
Pardeshi S, Mandke AN, Mandke N: Suppression of the inflammatory response to cardiopulmonary bypass..
Rasmussen B, Laugesen H, Sollid J, et al..
Oxygenation and release of inflammatory mediators after off-pump compared with after on-pump coronary artery bypass surgery..
Ucar HI, Tok M, Atalar E, et al..
Predictive significance of plasma levels of interleukin-6 and high-sensitivity C-reactive protein in atrial fibrillation after coronary artery bypass surgery..
Brix-Christensen V, Petersen TK, Ravn HB, et al..
Cardiopulmo-nary bypass elicits a pro- and anti-inflammatory cytokine response and impaired neutrophil chemotaxis in neonatal pigs..
Gorman RC, Ziats N, Rao AK, et al..
Surface-bound heparin fails to reduce thrombin formation during clinical cardiopulmonary bypass..